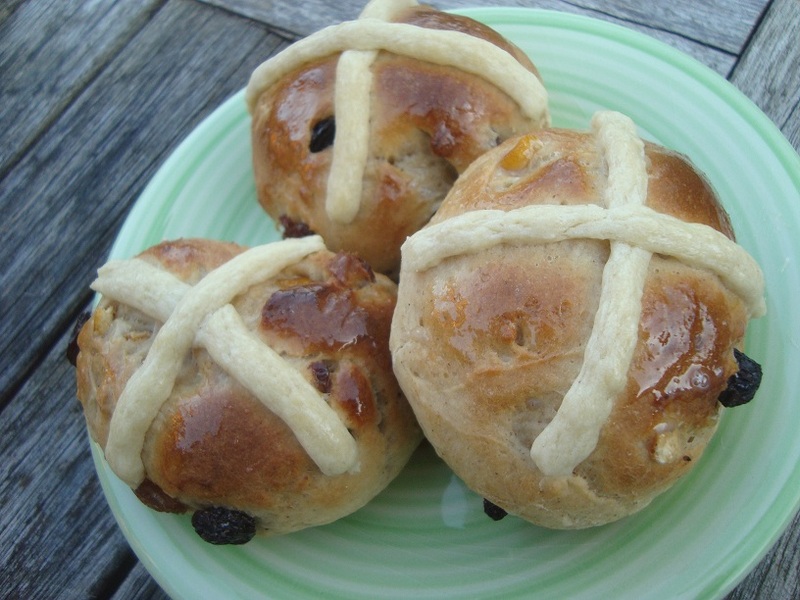 There are so many great things to make and bake at Easter time and hot cross buns are one of our favourites. They don’t always look as neat and tidy as the ones you buy in the supermarket, but they certainly taste just as good, in fact, they probably taste much better! You may think that they are fiddly to make, but actually, they aren’t too tricky. All you need is a little time, a few inexpensive ingredients, and if you have a couple of small willing helpers then it’s all the more fun. 1. 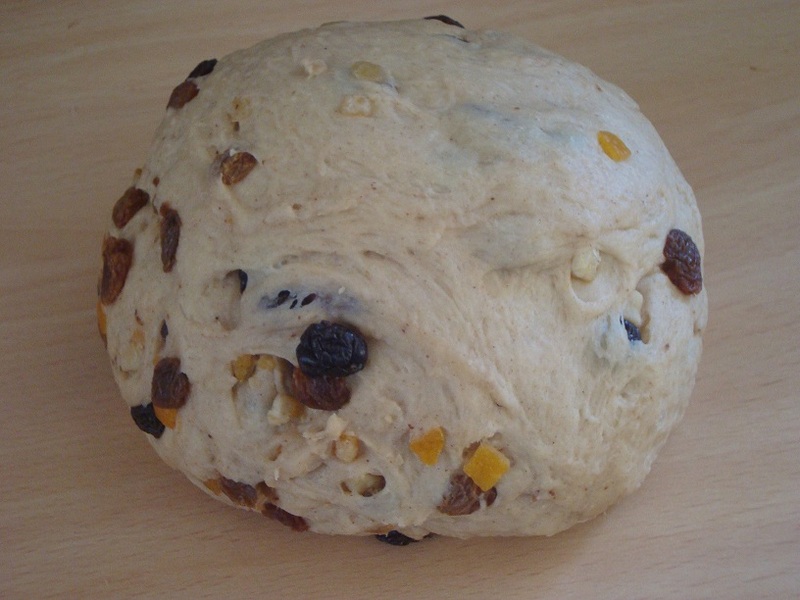 I like the fruit in my hot cross bun to be nice and juicy so after washing it, I soak the dried fruit in hot, black tea for 30 minutes while I gather together the rest of the ingredients. Drain it well before adding it to the other ingredients so you don’t make the dough too sticky. 2. I often make my dough in a bread machine so if you do this, add the ingredients in the order that your machine instructions indicate (mine is liquids first followed by dry ingredients). 3. If you are making it by hand, place the bread flour, yeast, sugar, salt, ground mixed spice and cinnamon in a bowl and make a well in the centre. Add the egg, milk and melted butter and mix until the dough comes together. 4. Make the dough into a ball and leave to rise in the bowl in a warm place, covered lightly with a tea towel or oiled clingfilm. 5. When the dough has doubled in sized (after around an hour), tip it onto a lightly floured work surface and knock the air out of it gently. Then knead in the dried fruit, form into 12 equal balls and place on a baking tray. Cover and leave again until the have doubled in size. 6. 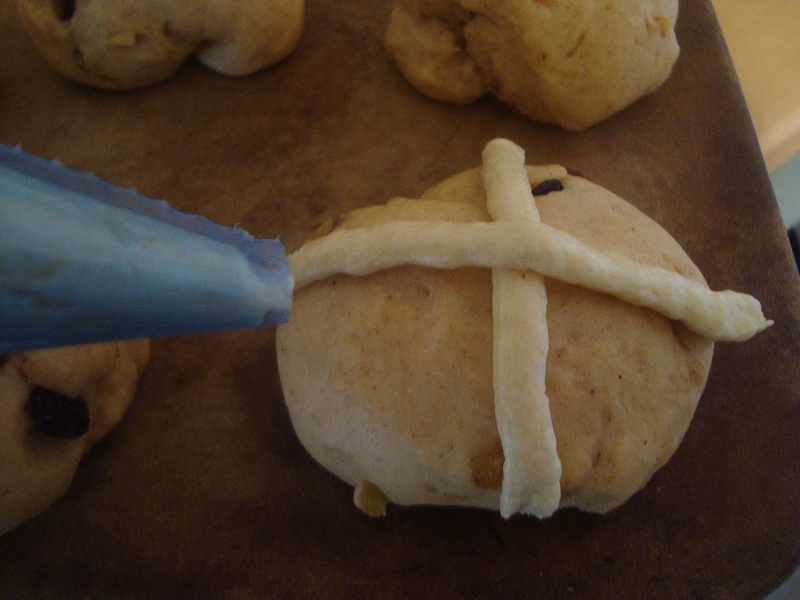 Preheat the oven to 200°C and make the pastry for the crosses. Melt the butter then sift in the plain flour. Mix until it is well combined then add a little cold water, a teaspoon at a time until the pastry is soft enough for you to pipe. 7. Place the pastry into a piping bag, snip the end and pip a cross on top of each bun. Bake in the centre of the oven for 15-18 minutes until the tops of the hot cross buns are a deep, golden brown. 8. While they are cooking, make the glaze by heating the milk and sugar in a small pan until all the sugar has dissolved. 9. Remove the buns from the oven, brush with the glaze and leave to cool. These are delicious eaten warm and spread with butter or toasted the next day… if they last that long! Enjoy! My 2.5 year old and I made these today and we’re now tucking into our warm hot cross buns! Been meaning to make them for years but usually the lure of chocolate-based baked goods trumps! Take that, chocolate! !